The ultimate tool for fashion sketching! 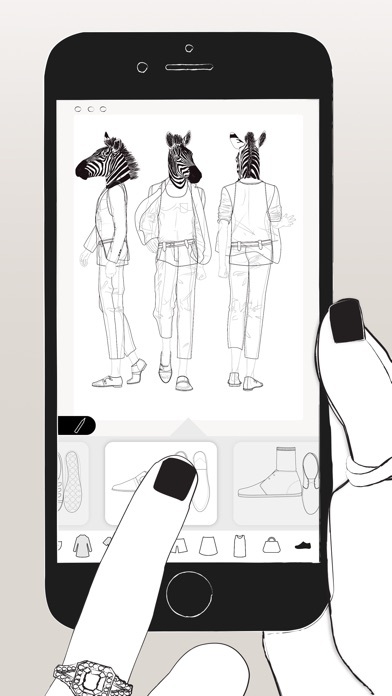 Prêt-à-Template is your digital sketchbook with a variety of fashion-related templates, including bodies, garments, shoes, and accessories. All templates feature side, front, and back views that give you all the proportions and scales needed. Make beautiful sketches with an amazing set of realistic brushes, fabric patterns, and custom color palettes. All the powerful tools you need to unleash your creativity. 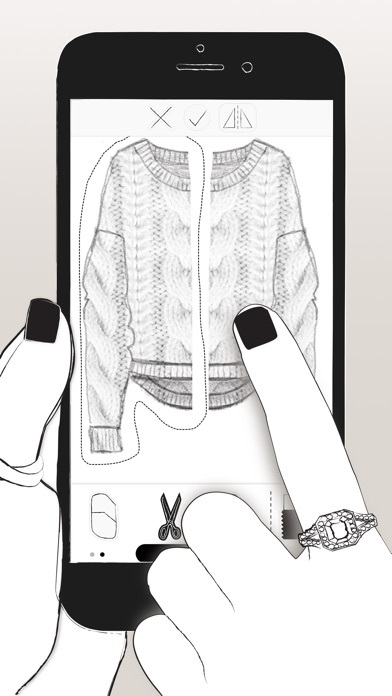 Turn your device into a fashion sketchbook. Have your sketches with you anywhere you go and register ideas whenever they come up! MAKE YOUR OWN TEMPLATES Make endless combinations of stylish outfits and customize appearances with Puzzle Look. 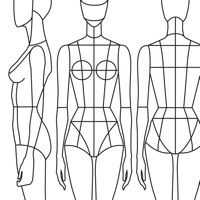 Select from a range of clothing templates, hairstyles, and body forms to create the perfect template for you to sketch on. FEATURES - A sketchbook with unlimited pages! - Over 1,000 templates, including bodies, clothing, shoes, and accessories - Create endless combinations of templates with Puzzle Look - Turn templates on and off as you sketch - Copy and modify projects while keeping the original - No quality loss when zooming in and out - Co-create with friends through iMessage - Easy to store, send, and share - PSD export with Adobe Creative Cloud - iCloud sync across all your devices - Support for Split View on iPad - Works offline BRUSHES AND TOOLS - Realistic brushes: pen, felt pen, pen brush, pencil, pastel, highlighter, watercolor, and smudge - Import photos and images - Over 70 fabric patterns - Real sketching experience: draw with finger, stylus pen (not digital), and Apple Pencil - Smooth and precise brush strokes - Scissor tool: select an area to duplicate or mirror - Pin tool: pin images to a sketch project and use them as references, to make annotations, or to generate a color palette from them SUBSCRIPTION PRICING AND TERMS - Prêt-à-Template is a subscription app. Download it for free and try out selected features. Get unlimited access by subscribing to one of the three auto-renewing subscription options: yearly, quarterly, and monthly (7-day free trial available). - These prices are for United States customers. Pricing in other countries may vary and actual charges may be converted to your local currency depending on the country of residence. - Your Prêt-à-Makeup subscription will automatically renew at the end of each term and your credit card will be charged through your iTunes account. You can turn off auto-renew at any time from your iTunes account settings but refunds will not be provided for any unused portion of the term. I was very disappointed that there wasn’t really anything you could use that you didn’t have to pay for. The basic for this app is sad. I was just looking for something to sketch ideas in quick while I’m on the go. Listen to the other don download views! I didn’t and I should of. You guys are like all the rest money money money is all you think about I wish something was free for once but no everyone just wants money so thanks for nothing. I just got a response and I don’t believe it. They are all the SAME!!! You know i wish the app would be more about the love of designing and drawing and less about making monthly income with the subscriptions. I would gladly pay a one time fee of whatever they charge instead of this. Its like u dont pay a monthly fee for your markers in real life...why should we pay it here. I downloaded it because it looked cool and would help me with my art but there’s only 1 free option to dress up the models (stupid options to) and it would’ve been great to know just how “free” this app actually was ahead of time. To get anything or design anything good u have to pay a certain amount of money a month! I downloaded it and kept it for about two minutes. It would be way better if you didn’t have to buy anything. You can’t hardly do anything without spending money. Use to be a great app that I really loved but then it all went to crap. Sketches disappear for no reason. There is no IT support to help. I finally found a contact online and it was answered by someone who told me it was my internet connection?? How does that work when I sketched my drawings natively on my iPad. So if I’m on an airplane with no WiFi anything I sketch then won’t be saved and anything I sketched previously won’t be loaded all because of my internet connection??? And all this from an $8/month subscription app?? What an absolute joke. After a week of constantly asking via email how to fix this they just ghosted me and stopped responding all together. How unprofessional is this company? DO NOT PURCHASE!!! I’ve been looking for an app like this for so long and I was so excited when I found this app. I used it for a while and I liked it, despite its minor flaws, but I could look over them. Now, I’m beyond annoyed. I was working on a design and the app kept glitching, either kicking me out entirely or the screen would turn white. Now, a design of mine, which was probably the best thing I’ve ever drawn, was deleted because the app glitched. I’m beyond dissatisfied and so so upset. Never using this app again. One free template of everything, hair, pants, shirt, dress, everything else you have to buy. Had this app a few years back, decided to redownload on my new phone. Crashes as soon as I try to do anything. I installed this app to create costumes for the characters in my stories. Earlier today, I was opening the app to create one for my friend. I clicked on the woman's body structure option. However the screen turned black and, after 30 seconds or so, it took me back to my home screen. I tried this again twice after waiting a little, but i faced the same result. Additionally, everything is too expensive and there is about 3 outfits that you can create with the free version. 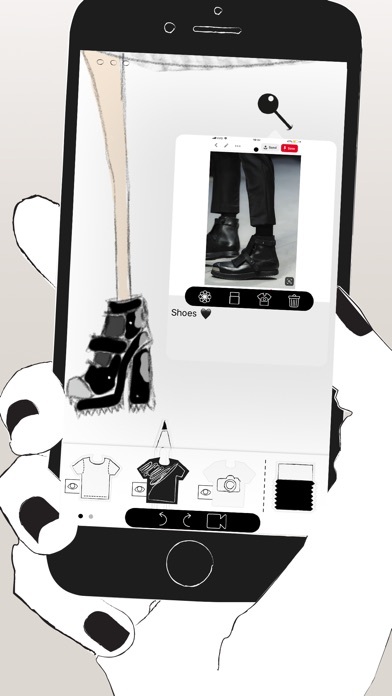 If you want an app to create outfits, get Fashiondesign. It is much better. Absolutely horrible. I just downloaded this and can’t even use it because it keeps crashing. Don’t download. You’ll just have to delete it. If I could rate this app zero stars I would. I downloaded it and it seems very nice and professional but whenever I click on something at the beginning it just crashes and gets me out of the app. I deleted and reinstalled it but the same thing is happening. I think Pret-a-Template is the gift that keeps on giving - to the developer, that is. I’ve been using it with a good stylus since it was released and plan to get an Apple Pencil. I like the app, but the pricing has gotten crazy over the years. There’s no other app out there like it, but there’s an opportunity for another developer to come along and release a competitor with a less convoluted pricing model. The new update sadly made your app the worst. Limiting the access to pencils that are needed I’ll just make the user erase your app. You should take your app to the old update. Worse mistake ever, I enjoyed your app until now. Why am I being charged. It was unbearable, so much stuff was locked I wish the would have it for a solid price not a subscription!!! This was not satisfactory, it came with a few brushes and only like 3 templates but that’s IT. PLEASE MAKE CHANGES!!!! I got this thinking I could do some really cool and cute designs, but u have to pay for everything in there. I deleted it because I couldn’t do a single dam thing on it. 😡😡. This needs to be fixed immediately. $8 for an eraser? Hell no. This app seems to be a good idea. I liked the look of it, and I think it’ll be a good way to draw out design concepts. However, I do have one serious complaint after just barely trying it. The pictures and movie on the app page show very plain models, but in the app the free models show too much in pertinent areas. There is no need for that just to be able to design. They especially don’t need to be that graphic. Dots and increase in sizes would be enough. Especially since this app is rated for 4+ in age. Should be rated higher if you’re going to get that specific. I recently downloaded this app and was having a good time on my first project (had spent over 2 hours on it and was almost done) until it crashed and lost all of my work. I am not patient enough to try again anytime soon, but I will update my review if I get better luck next time (if there is a next time). And this app is perfect so I can put ideas down to try in my 3D modeling programs. Just wish it would split screen. I love to watch fashion shows while I draw out my designs. I am on iPad Pro -updated 4-19-2017 I love I mean love the updates! However hate the subscription model. For those of us who would rather buy only what we need, you left us out. Maybe I only want the clutch template and am fine with paying a buck or two to just have that. Also why force creative cloud? I have iCloud, don't need or want another space to maintain. And what happened to the instagram feature? Was hoping that would get working. Love the recording feature, but probably won't use it if I am forced to use Creative Cloud. Had to dock a few stars for the bad sub model and things I mentioned above. Otherwise great job. PS I have no problem with you having a subscription model, just want the option to go a la carte if I choose to. This app is so much fun.AKA Awesome. People who love to do fashion hears your chance!!! 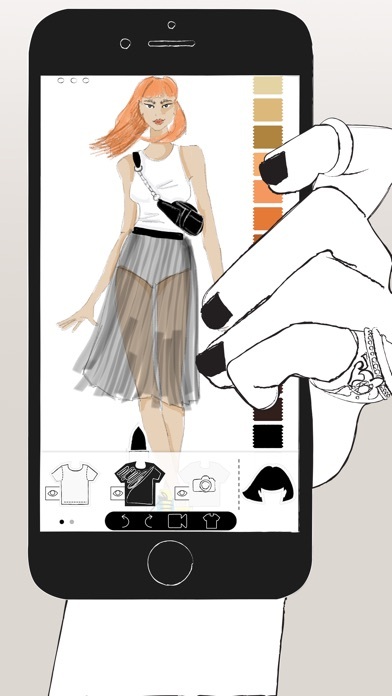 I bought this app hoping it would help me with my future fashion designing career. Once I opened the app there were so many in app purchases that you needed to make. There was only one free option for every clothing category. It limited my options since I cannot spend money on that. Overall it’s a great app. But only if you are willing to spend money on it. I don’t usually write reviews but.. wow. Seriously? It may look appealing.. but once you download it, you gotta PAY in order to actually do anything! I mean, it’s good.. ur it would be WAAAY BETTER if you don’t have pay for everything! I mean, if this was a paid app with everything, it would be a good app I’d recommend.. but no. It’s a “Free” app where you must pay in order to use most of the things..
You have to buy almost everything !!!!! I liked the original version better. You could pick and choose what individual features you wanted to buy. Although, some of the new features are nice, paying monthly for this app just seems unnecessary and in the long run a waste of money. How come the monthly and yearly subscription prices are NOT LISTED in this app description in the “In-App Purchases”? 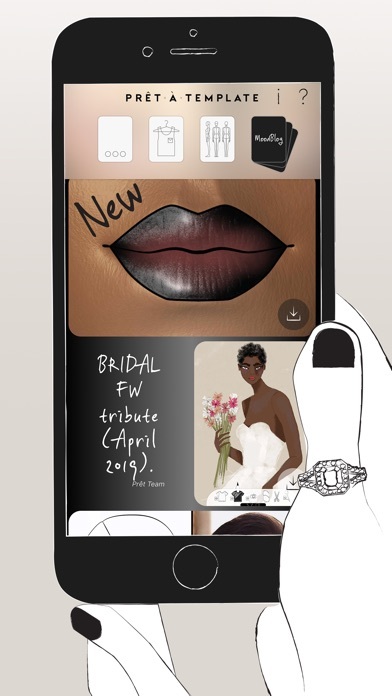 I downloaded Pret-A-Template because of an Apple App Store article showcasing what apps fashion designers use, and the article included a “Get” link, I am NOT a fashion designer, but I am an artist, so I got it just to check it out. The “Get” button is usually an indicator of a free app (possibly with in-app purchases). Maybe it’s a “try before you buy” deal. That’s understandable. While it looked ok, it wasn’t for me. I deleted it, but I did notice buttons or ads or something for Free Trial for 7 days (which in the in-app description, a “Unlimited Access -trial” is $5.99 - kinda playing loose with the word “free” there don’tchaknow), a monthly subscription, and a yearly subscription. While a discount for the subscriptions are bannered, the PRICES for each subscription is never disclosed. A quick check here in the App Store has no price(s) for any subscriptions. This is very deceptive. Or maybe just sloppy. I’m all for companies making money by selling apps, but you don’t have to be sneaky about it! Also, you have “Unlimited Access” listed twice in the “In-App Purchases” section. One for $13.99 and one for $39.99. Kinda silly. Who would buy a $40 “Unlimited Access” against buying the same “Unlimited Access” for $14? There’s a third “Unlimited Access” but it actually reads: “Unlimited Access-Trial” for $5.99... but, again, IN the app, a trial is FREE for 7-days. Be proud and transparent about your pricing of your app. If it’s a good app, that is. Hah... no eraser tool without BUYING the app! Hah! Again, a “try before you buy” application of policy I suppose. I think that this is the best game ever.;). I like it that u. An design ur own outfits as a man, woman, or kid. If I were to change just one thing it would be to make all of the "in store purchases” free and not a purchase in the game. I purchased this app near the time it first came out. It was glitchy, and did not always work the way it was expected to. But, with the consistent improvements my love for this app did not grow cold. Now with the latest improvements, it’s better than before and I expect future changes to make it a more effective tool. I don’t see any other app like it for iPad Pro and/or iPhone users. No other app comes close. 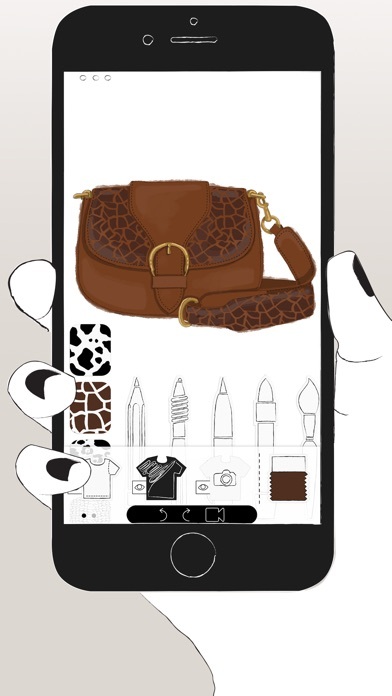 Magnificent fashion design/illustration app!! Price is extremely steep considering what you get. Wish there was just a way to buy upfront rather than having to pay hundreds of dollars. I’ll stick with procreate and just find some fashion templates online - for free. PLEASE MAKE IT SO ITS FULLY FREE!!! Great App. Just wish that you guys could add a notes feature so that we can add notes regarding the designs (i.e. measurements, desired fabric, etc.) also maybe the addition of some more ethnic hairstyles would be dope. Overall it’s a great app.. This app is AMAZING for every designer. But maybe you coukd add a “fill” bucket to the brushes(for free please!) So you can fill in the body parts with the desired color. :) Otherwise awesome! I downloaded this app about five months ago and deleted it and it is still charging me money for it and I have tried to fix it several times but it is still charging me...SO MAD!! Buy this app at your own risk. Well the preview did not tell us that you need to purchase almost everything. I thought this was a great app but it feels like one of these 12 yr old dress up games that you need to purchase everything to unlock...;_; crushed all my hopes and dreams I don’t even want to be a fashion designer anymore. I’ll just go back to my Kdrama.